The kiwi is a small, soft-fleshed fruit with a delectable and distinctive taste. The kiwi is really a vine not a tree, but it grows so large that one needs to treat it much like a tree, so we include it in this tree-fruit section. The fuzzy kiwi, though it long dominated the rapidly growing kiwifruit market, is the least flavorsome of the types, and also the greatest nuisance to prepare or eat, owing to its skin. The so-called “hardy kiwi” types are now emerging as the preferred alternative, inasmuch as they may be eaten out of hand, are better tasting, and have a wider growing zone. Of the hardy-kiwi species, A. polygama, known as “silver” kiwi, is reported by some to be of good eating quality, but researchers at Oregon State University reported that “we have not had good success with this species at NWREC. Our fruit goes from green and unripe to orange and soft with an astringent peppery flavor. Plants are moderately vigorous, but more susceptible to cold injury than arguta or kolomikta.”. We will thus confine our attention here to the species A. arguta (commonly just called “hardy kiwi”) and A. kolomikta (commonly called “Arctic Beauty”). Choosing between those two is not a simple matter, and we discuss that more a little farther down this page. Male and female flowers are borne on different plants, so both male and female vines must be planted, preferably interspaced for optimum pollen spread (one male vine can pollinate 5 to 8 female vines). The plants often take several years to mature—from 3 to as many as 9 years (though more than 3 is unusual, and some are even quicker). Though the plants are extremely winter-hardy, they develop shoots early in the spring that are quite sensitive to frost. There can be “shoot burn” in many years; though the plant usually survives, regrows, and eventually fruits despite, fruit will not develop that year. 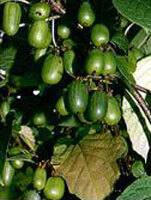 Hardy kiwi are extremely vigorously growing vines, requiring a substantial supporting trellis. But, as one source says, Despite the challenges, once one has sampled the fruit, kiwi growing seems well worth the trouble. The fruit is aromatic, with fuzzy kiwi, banana, strawberry, and pear flavors all wrapped up in one delightful package. The decision involves a trade-off. Actinidia kolomikta is very cold-hardy as a plant: that is, the basic plant reportedly can remain alive through winter temperatures as extreme as -40°F. But kolomikta requires materially fewer chill hours than arguta, and thus breaks bud materially earlier, and the buds are not frost-tolerant. There is thus a significantly greater risk with kolomikta types that they will break bud before winter’s end, perhaps during a brief mild spell, then have the blossoms be massacred by chill temperatures. That can certainly also happen with arguta types, but the risk is a little lower. We should perhaps emphasize that point: A. kolomikta types often bear a decent amount of fruit in their very first season after being planted out, whereas A. arguta types can take two or three years (occasionally, depending on your exact growing conditions, even more) before they bear useful amounts of fruit. So losing an A. arguta planting is not just a matter of planting anew: it’s a matter of planting anew and waiting a few years. Oh, and something else to add into the decision mix: A. kolomikta types require substantial shade. Grown in full, steady sun, they do not thrive, and indeed often just die. They want no more than at most a few hours a day of direct sun. A. arguta types do not seem to have that problem. In our garden, the average annual lowest temperature is -15°F. Our personal weather data run more than 21 years, and in all that time we have had exactly 8 days on which the low was below -10°F. and exactly one day when it got below -25°F. (And those strikingly low temperatures were anticipated by the weather service, so one could have done things like mulch heavily and/or put out plastic soda botles filled with hot water.) In our case (and especially since we don't have a shaded area we could trellis for vines), the choice would thus be a variety of Actinidia arguta, preferably an especially cold-hardy sort. If you are in a climate like ours (and if you don’t have the kind of personal weather database we have, you can look up your local weather data), you also probably want an arguta variety. But YMMV! Regardless of study results, you can’t grow what you can’t buy. Choices of type are limited to what seedsmen offer. What we have seen offered of A. kolomikta types are listed below. Be reminded that “Arctic Beauty” is not a particular type, but rather a designation for the entire kolomitka species. There are also numerous listings for male A. kolomikta vines, often with no variety specified (but that really doesn’t matter, as the male vines do not normally fruit). What do we know of particular cultivars? In Europe, and latterly China, there are large numbers of cultivars; there has been an especial development effort in the Baltic nations (notably Lithuania), whence many of the better cultivars available today (and why so many of them have Slavic-sounding names). But all we have are the ones listed above (unless you find something we missed). First off, one study of kolomitka types found that “The differences in the time of bud burst, blooming, shoot growth and leaf fall comprise only 2 - 3 days for all of the cultivars studied, while the harvest maturity differs more considerably.” So we aren’t going to get around the bugaboo of early budding by cultivar selection. Also, “Except for one-year–old plants of cultivar “Lande”, which showed rather medium winter hardiness, other investigated cultivars wintered poorly. However, the two-year-old plants were sufficiently hardy [in all tested cultivars].” So cultivar type doesn’t make much difference there, either (inasmuch as “Lande” seems unavailable). If there are rational criteria for making cultivar choices, they are hard to discover. You can review the various links we provide farther down-page to see what you think about others’ experiences and claims. Again: you can’t grow what you can’t buy. Choices of type are limited to what seedsmen offer—though there are quite a few more choices than for kolomitka types. What we have seen offered of A. arguta types are listed below. There are, again, numerous listings for male vines, often but not always with no variety specified (but that really doesn’t matter, as the male vines do not normally fruit). And again: if there are rational criteria for making cultivar choices, they are hard to discover. You can review the various links we provide farther down-page to see what you think about others’ experiences and claims. These are just a few summary notes—consult the various web pages linked farther below for more detail. Hardy kiwis of both species prefer a sound, loamy, pH-neutral soil. Above all, the soil drainage must be perfect. Full sun is said to be best for good fruit production on arguta types, but pernicious for kolomitka types, which require partial shade. Either way, the vines should definitely be well-sheltered from wind, especially in the colder months. A. kolomikta is inherently quite cold resistant (but see farther below), with dormant plants hardy down to, it is claimed, -40°F. The chief problem encountered in growing kolomitka kiwis is that they are fairly low-chill plants, meaning that they are all too likely to break bud a lot sooner than we’d like, and consequently encounter freeze damage to the developing buds (even though the plants are safe enough). In a bad year, spring freeze damage can mean no crop that year. The vines grow well on a wall, and can also be grown into trees. They are vigorous climbers, and require a sturdy support. If you are growing kiwi vines, beware! Cats are very fond of these plants—reportedly more so even than of catnip—and can easily destroy them by scratching at them. Plant the largest vines available, allowing one (nonfruiting) male for up to eight (fruiting) females. The vines can be supported on a T-trellis that is about six feet high and wide, with 3-5 wires (#12) strung between the arms of the T. In that scheme, space posts sixteen feet apart, with plants at half that distance, as shown at the right. Although hardy kiwifruits are, as their name implies, cold hardy, that cold-hardiness comes only with age; young plants (especially first-year vines) commonly freeze back, delaying production. So plant the largest vines you can get hold of, and protect the developing trunks from winter sun and cold with “Tree-Shelters”, corn stalks, burlap, pipe insulation, or tree-wrap material. Keep in mind that the trunks of hardy kiwifruits are rarely exposed to full sunlight in the wild, so don’t be afraid to wrap them well. Fruit is produced on second-year wood, or on fruit spurs on older wood; pruning is best carried out in the winter, while the plant is dormant. The fruit should be picked during what is called the “technical maturity phase”, because after that they get soft rapidly and their skin starts to break. One source reported that the technical maturity of mid-season kolomikta kiwi cultivars starts about 58 to 66 days after their full bloom, though another source referred to picking around 50 days after pollination. With those very rough guidelines, a little experimenting the first time a vine fruits should give sufficient insight. Growing arctic kiwi (Actinidia kolomikta): advice and recommendations? Hardy Kiwiberries: Minnesota's next fruit crop? The genus Actinidia contains about 60 often quite various species. All Actinidia species are perennial, climbing, or scrambling plants; most are deciduous, though a few from warmer areas are evergreens. All species appear to be dioecious: that is, the flowers on male vines produce viable pollen but lack a properly developed ovary, ovules, or styles, while the flowers of female vines appear perfect, but the pollen they release is shrivelled and non-viable. That all means that one must have both male and females vines present to produce fruit. The fruits of the various Actinidia species are all berries, in that they are fleshy, have many seed embedded in the flesh, and do not split open at maturity. Horticulturally, however, they display great diversity, often in the attributes that are important to growers. For example, the fruit can occur singly, in small bunches of three to five fruit, or sometimes in larger bunches or infructescences containing up to 30 or more fruit. They can vary in size, shape, hairiness, and external color. Some species change color as they ripen. The flesh can also vary in color, juiciness, texture, and composition. The fruits of some species are basically inedible or, at best, unpalatable, whereas the flavor of the fruit of others is considered superb. The four species of use for edible fruit are A. deliciosa, the “standard” kiwifruit; A. chinensis (only recognized as a distinct species in the early 1980s), a type a bit smaller, and much more nearly hairless, than A. deliciosa and reportedly of much better flavor, and now very popular in China; A. arguta, which is the more common sort of what is now called the “hardy kiwi”, and has a significantly better flavor than the “standard” kiwi; and A. kolomikta, (the “Arctic Beauty” species) another “hardy kiwi” that is even hardier than A. arguta. The kiwi, unlike most common fruits, is a strikingly modern development. A mere century ago it was just a wild plant growing in China; by 1970, it had been developed into a major new fruit crop in New Zealand. Today, the kiwi is an important commercial crop grown in several regions of the world: it has also become an important element of international trade , the three biggest producer countries exporting almost all the kiwifruit they produce. Total world production now exceeds that of such well-established crops as raspberries and currants, and is likely to soon exceed the production of strawberries and apricots. Almost all kiwifruit cultivars being grown in orchards outside China are descended from just three plants—two female and one male—themselves derived from a single seed introduced to New Zealand in 1904, a seed probably collected at Hubei or Sichuan in China. Kiwifruit contain large quantities of the enzyme actinidin, which will tenderize meat, for those who still eat dead animals. It was last modified on Sunday, 10 February 2019, at 21:25 EST.